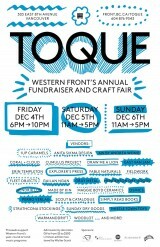 TOQUE is Western Front’s annual fundraiser and craft fair. Held every December in the Luxe Hall at Western Front, the event features a curated selection of talented B.C.-based artists, designers and artisans and attracts over 2000 visitors. 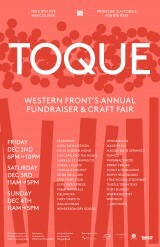 Proceeds from TOQUE support the year-round art and music programs at Western Front. 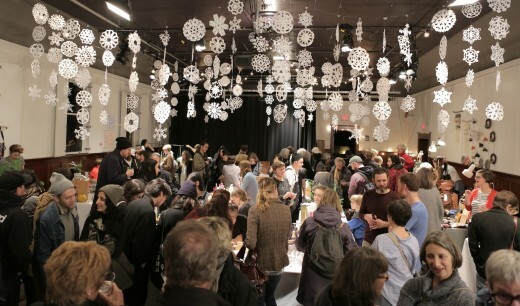 Renowned as one of Vancouver’s most well-curated craft fairs, TOQUE has been cited as ‘the most artful of all the artisan fairs’ by Georgia Straight, ‘a true artists’ fair with a solidly local feel’ by Scout Magazine, and has been featured on Breakfast Television with Susie Wall, BC Living, Montecristo Magazine, and more. Invited vendors contribute to TOQUE with wares ranging from books and cards, to jewellery, textiles and ceramics. Past events have included vendors such as Simply Read Books, Banquet Atelier and Workshop, Erin Templeton, Anita Sikma Design, Fieldwork, Gailan Ngan, among many others. 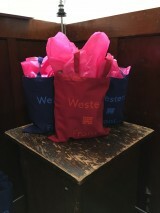 Also available are Western Front publications and a limited edition artist-designed tea towel commissioned for the event from artists such as Jacquelyn Ross, Katie Lyle and Kim Kennedy Austin. For media and sponsorship inquiries please contact development@front.bc.ca.